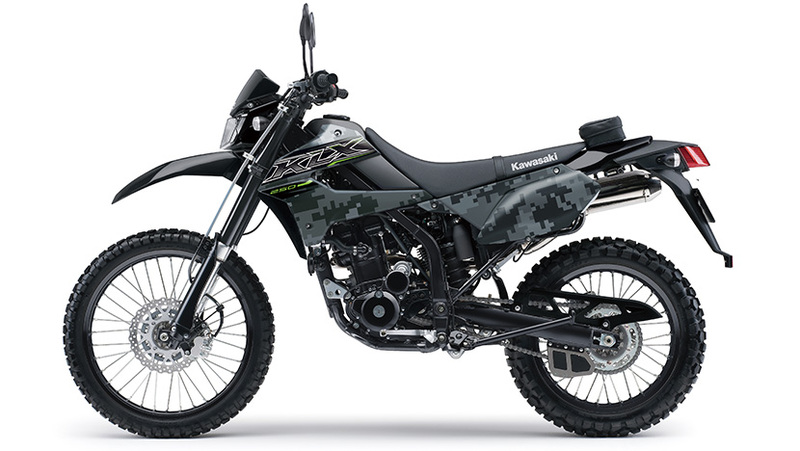 Capitalising on its already potent package, the new KLX250S not only gets a complete makeover, a number of engine and chassis changes further enable serious riding both on and off the road. 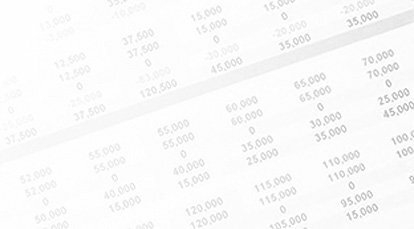 With a bore and stroke of 72 x 61.2 mm, the power unit displaces 249 cm3. The engine is mounted low in the frame, contributing to a low centre of gravity. Flat-top piston and pentroof combustion chamber deliver a 11.0:1 compression ratio. Lightweight piston, piston pin and connecting rod allow power-producing revs. 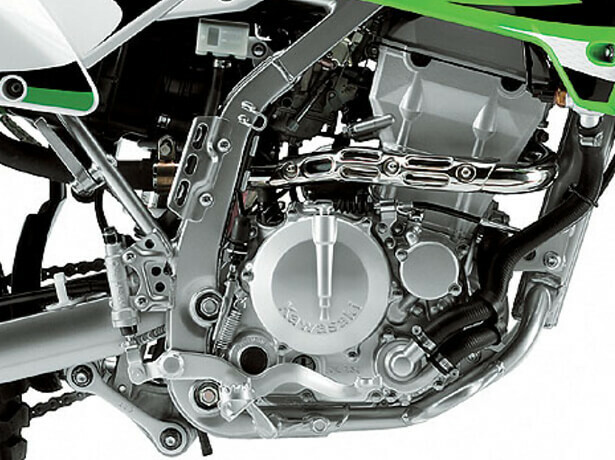 4-valve DOHC cylinder head provides maximum valve area for optimum flow. Low reciprocating weight (thanks to the use of a cam lobe for each valve, with shim-under tappet arrangement) contributes to higher efficiency at high rpm. Where 6th gear on the previous model was almost an overdrive gear, revised gear ratios see the 6th gear set closer to the 5th gear, facilitating shifting for increased performance off-road and on. 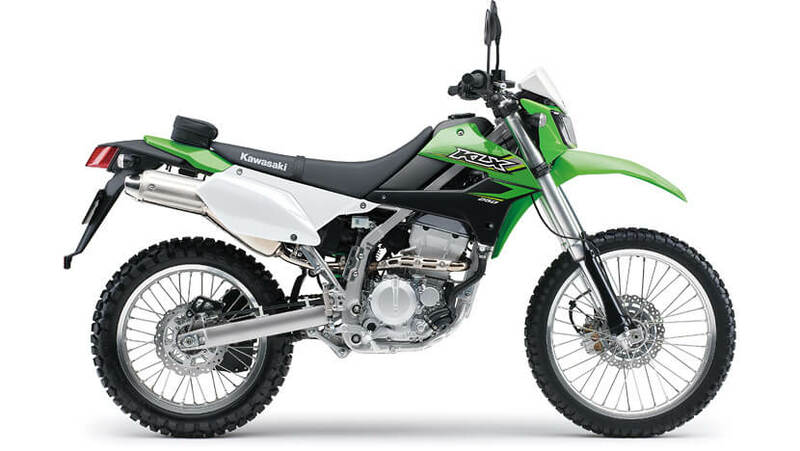 The KLX250S’s box- and tubular-section high-tensile steel perimeter frame creates a slim, lightweight package. The 26.5° caster angle and short wheelbase contribute to quick handling, while the high rigidity of the frame ensures straight- line stability. 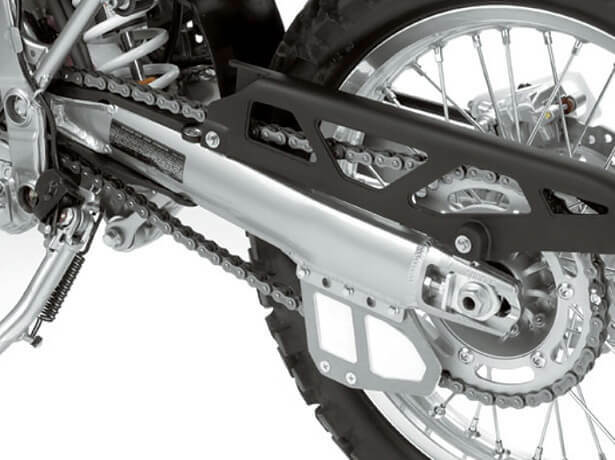 The new lightweight, highly rigid aluminium D-section swingarm contributes to reduced unsprung weight. 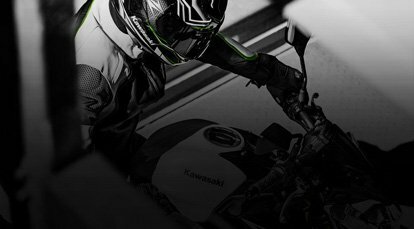 New KX racing-type chain adjusters allow precise adjustment of chain slack, helping to minimise drivetrain power transfer loss. The 43 mm inverted cartridge-style front fork comes with 16-way compression damping adjustment. The cartridge provides consistent damping force by minimising aeration of the fork oil. KX-style fork guards protect the inner tubes from rocks and brush. 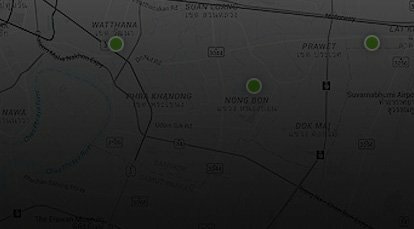 Uni-Trak rear suspension provides great road holding ability and bump absorption. 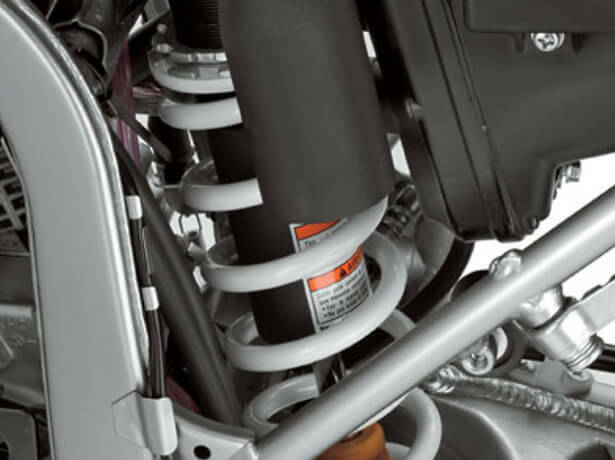 The gas-charged shock with remote reservoir has 16-way compression and rebound damping and fully adjustable preload adjustability. Front and rear disc brakes offer impressive stopping performance. A twin-piston caliper grips a 250 mm disc up front. 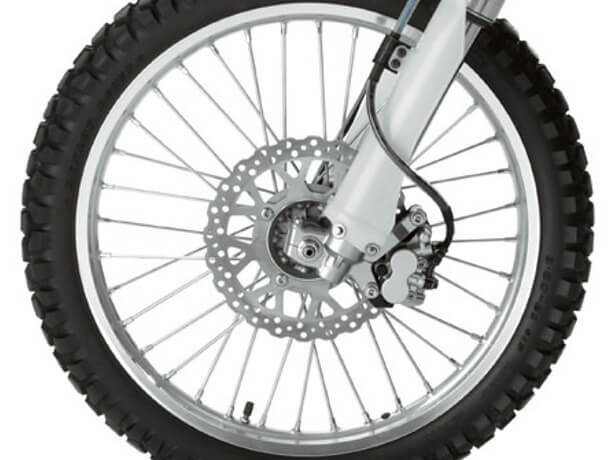 At the rear, a single-piston caliper operates a larger 240 mm rear disc. The larger rear disc (previously 220 mm), revised lever ratio, new pad material and different caliper offer increased rear brake control, facilitating minute adjustments. Front and centre, a new front cowl and headlamp design give the KLX an aggressive new visage. New off-road front fender contributes to the aggressive design. 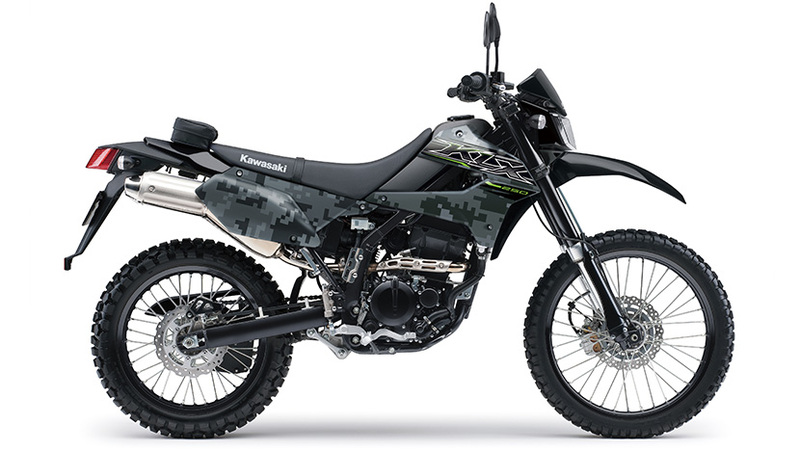 Radiator shrouds are two-piece constructions like those on our KX motocrossers. 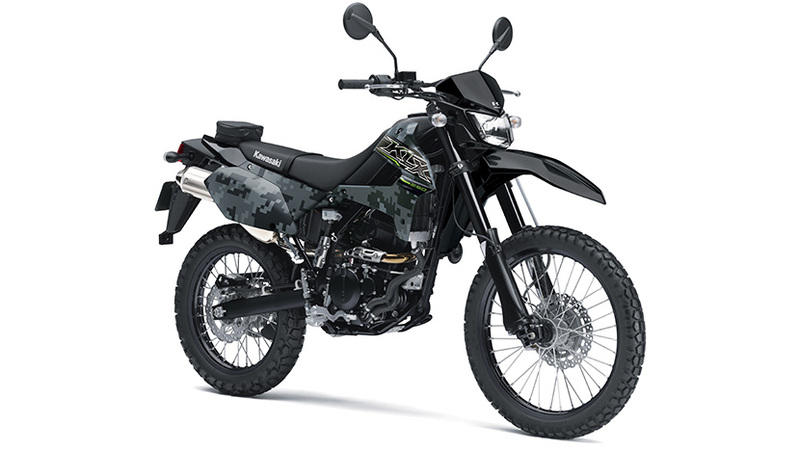 Off-road style rear fender is a two-piece construction. Sharp tail light design offers increased visibility and further contributes to the KLX’s aggressive new styling.